It went out of print on Unknown, and will not be published again. Information in this article is limited because of this. 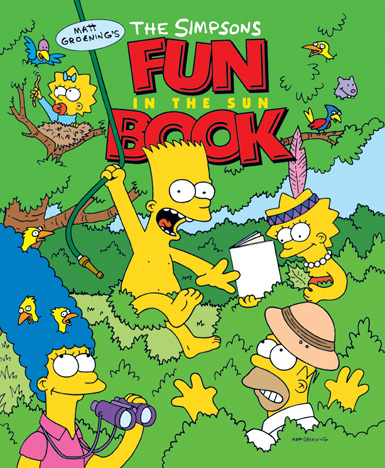 The Simpsons Fun in the Sun Book is a book with activites for children to complete, that was released in May 1992. Drop that remote control, man! Don't waste another glorious day inside, shriveling up in front of the tube. The time has come for action, outdoor activity, health and fresh air! Remember them? Inside this book you'll find all sorts of ruff-and-tumble games and activities for one, two, or a whole tribe of would-be nature enthusiasts. Whether your playground is made of asphalt, grass, or just the stuff of your imagination, there is enough fun jam-packed into these pages to satisfy even the grumpiest little sluggard. So don't let another day go by without basking in the pleasures this book has to offer. Get off your duff and get out the door! Get into some good, clean fun! Get natural naturally! Get crazy with the native! Just get home by dinnertime...or else! Modified on August 31, 2013, at 10:59.